Here are a pair of blades by Heisakuro Tadahiro, son of the famous Shinzaemonnojo Tadayoshi. 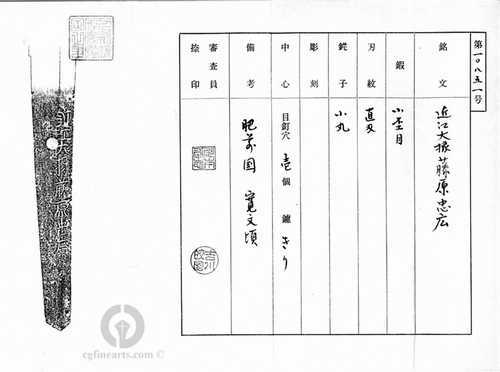 He was born in 1614, received the title 'Omi Daijo' in 1641 and died in 1693. They are classic Hizen Sugu Hamon and signed in the usual Hizen fashion - the Katana is signed Tachi Mei and the Wakizashi is signed Katana Mei. They are owned by the same collector, but the blades were restored at different times, using different agents. For this reason, the Katana bears a two-piece gold foil Niju Habaki and the Wakizashi a solid silver Habaki. They are both mounted in Shirasaya and are accompanied by N.B.T.H.K. Tokubetsu Hozon Origami (Katana) and N.T.H.K. 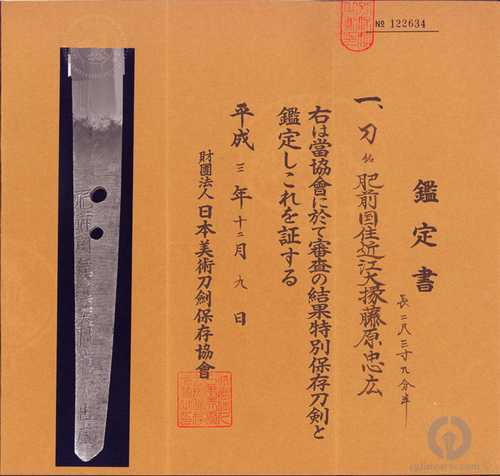 Kanteisho (Wakizashi).